Something had to be done. It was 2010 and the alarmingly high failure rate among students who were taking the university’s college algebra course had become a crisis. Somewhere along the way, MAC 1105 had become a stumbling block for 70 percent of the students who took it. It had the highest failure rate of any course at FIU. Failing it meant retaking the class, which meant delaying subsequent courses, which interrupted timely degree progression. You didn’t have to be a math whiz to understand that a number like this was holding back thousands of students who took the course annually and the institution that had made a commitment to educate them. In response, then-Dean of the College of Arts, Sciences & Education (CASE) Kenneth G. Furton received a $2.5 million grant from the Department of Education aimed at increasing course pass rates. Over the next two years, 11 individuals came together to rethink the way college algebra was taught at FIU. “The redesign wasn’t about ‘fixing’ the students. They’re not broken,” says Leanne Wells, director of Technology Innovations and Learning Architecture and former director of the Math Mastery Program. “It was about improving the way we teach our students.” An education researcher who specializes in how best to teach math, Wells helped keep the momentum moving forward throughout initial attempts to retool the course and along a sometimes-bumpy road. By the Spring 2012 semester, 50 percent of the students were now passing. At that point, Wells says, “The university went all in.” The first Math Mastery Lab opened in fall 2012. A critical component of the course redesign’s success, the lab is a high-tech, high-touch approach to improving student performance. It’s equipped with more than 200 computers and staffed full time with undergraduate learning assistants and serves as a meeting place for faculty office hours. It has been such a success that a second lab opened recently. The university spent two years redesigning the college algebra course, which has seen passing rates rise dramatically. 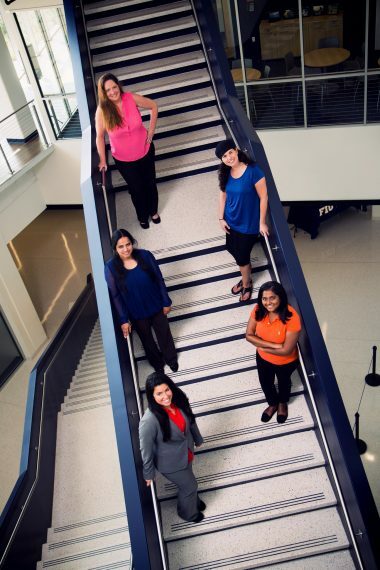 Team members pictured here, left to right, top to bottom: Leanne Wells, Roneet Merkin, Lakshmy Menon Narayanankutty, Shivanni Jagessar and Ada Monserrat. Not pictured: Jeremiah Hower, Bao Qin Li, Hamid Meziani, Suzanna Rose, Kieron Thomas and Anna Wlodarczyk. Today the pass rate for college algebra hovers in the 70 percent range, and universities from around the country visit FIU to learn more about the extraordinary transformation. Instructors in the Department of Mathematics and Statistics now meet weekly to go over what’s working and what’s not in all of the lower division gateway math courses, not just college algebra. The redesign of the college algebra course is part of a broader university initiative called the Gateway Project that involves the redesign of 17 lower division courses characterized by large enrollment (there are approximately 40,000 enrollments annually in these courses) with a high failure rate, a high attrition rate for students that do fail the class, or both. These gateway courses, as they are so called, include lower division math, general chemistry, general biology, intro to economics, English composition and some history and religious study courses. So critical is the Gateway Project to the future of the university that it was written into the university’s FIUBeyondPossible2020 strategic plan. A multi-year project, it’s expected that all of the gateway courses will be redesigned by 2018. How students perform in these courses is a strong predictor of how they’ll do in the rest of their academic journey. Little emphasis was put on these courses historically. That has changed, says Isis Artze-Vega, assistant vice president for Teaching and Learning. The Center for Teaching and Learning offers a variety of professional development for faculty such as summer institutes and reading groups and conducts student focus groups and surveys. In addition, center staff make classroom visits to observe faculty and the students they are teaching. Early results are promising, with most of the redesigned gateway courses showing improvements in passing rates, student dispositions toward the discipline and/or in meeting learning objectives. Several improvements in passing rates are in the single digits while others have improvements of 30 or 40 percent. On average, improvement in gateway course passing rates is approximately 15 percent. Much is riding on the success of the Gateway Project. In the fall of 2012, the Florida Board of Governors (BOG) began implementing its own transformative policies — in this case, changes to the way higher education in the state is funded. Comprising 17 members from across Florida, the BOG is the governing body for the State University System (SUS) of Florida, which includes Florida’s 12 public universities. The move by the BOG has forced institutions from Tallahassee to Miami to rethink the way they educate students. “We are at an inflection point in human history with the current decade likely to be the most disruptive period in higher education since the Academy was created by Plato 24 centuries ago,” says Furton, who became FIU provost and executive vice president in 2014. Education funding at the state level has been driven historically by enrollment and previous funding levels. With the exception of anxious parents, no one paid too much attention to how long it took students to graduate, what they studied or the cost of earning a university degree. But times have changed in the halls of state government and state leaders are intent upon improving educational outcomes. Tennessee became the first state, in 1979, to introduce performance-based funding metrics into its higher education system. More than 30 states have since adopted this model, which rewards institutions financially for positive outcomes in specific areas. Florida introduced the model in 2014, and in 2016, Gov. Rick Scott signed it into law. SUS institutions now compete against one another in 10 performance goals tracked by the BOG (see below). 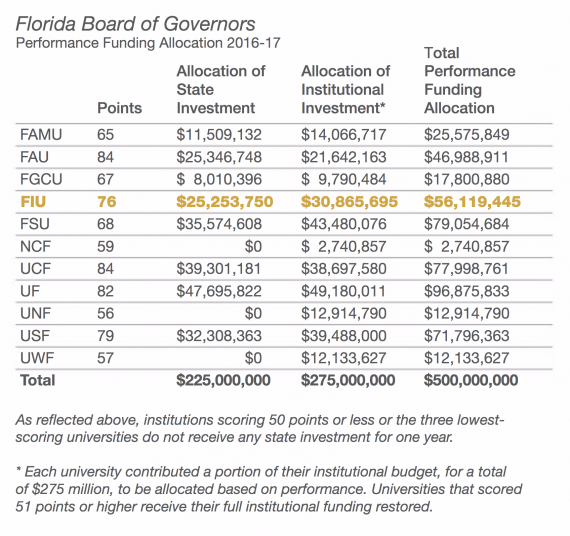 The funding formula is complicated, but basically, universities that score in the top three receive additional funding for their good performance and institutions that wind up in the bottom three lose all or a portion of their performance funding for one year (see below). 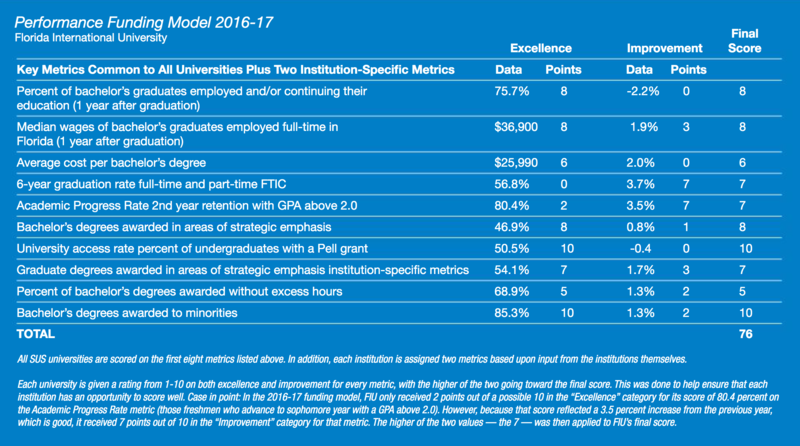 Critics of the model say it pits universities against one another and forces institutions with fundamental differences (student demographics, for example) to be measured against the same criteria. It is patently unfair, they say. But even those individuals acknowledge it has improved the educational journey for students by forcing universities to become more focused on student success. Since 2014, student graduation and retention have been on the rise across the state. Florida now boasts the second highest graduation rate among the 10 largest states in the country. The number of both undergraduate and graduate STEM (Science, Technology, Engineering and Math) degrees awarded annually is also up. In March, Florida was named the best state for higher education by U.S. News & World Report. The winners in all of this are the more than 350,000 students who attend a public university in Florida. One year after the BOG introduced its new funding model, FIU created a Student Success Initiative (SSI) office to provide intense coaching and support to first-year students. Student Success Manager Bridgette Cram and a team of four work together to create retention and graduation interventions. There are three interventions that have already demonstrated success: the College Life Coaching program, the Strategies for Success course, and the retention and completion grant program. The College Life Coaching program targets students who are on warning or probation after their first semester. Students in the program meet one-on-one biweekly with a college life coach. The strategy is working. For the fall pilot phase of the College Life Coaching program, 71 percent of the students who participated experienced a positive increase in their GPA and 43 percent moved from academic warning to good standing. The newer Strategies for Success class was piloted in the Spring 2017 semester. The SSI team is big on the personal touch. Students in danger of being dropped from their classes are contacted via phone calls and emails. Cram recalls the day she discovered a student was going to be dropped because she hadn’t accepted her Pell grant. Cram looked up the student’s schedule, went to her class and asked the professor if she could speak with the student while attendance was being taken. When they got outside the classroom, Cram handed the student her laptop that she had queued up to the page with the prompt to accept the Pell grant. The grateful student accepted her grant and remained an enrolled student in good standing. SSI awards retention and completion grants and develops policies to reduce obstacles; more than $50,000 was awarded in grants this past spring. 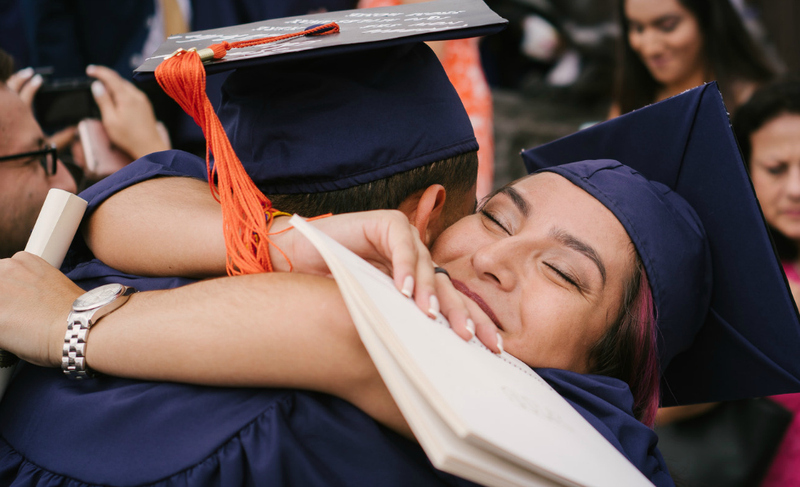 Grant recipients are students who are typically close to graduating but, in many cases, have exhausted their financial aid. Rather than have those students postpone their studies, FIU now steps in to help. Approximately 84 percent of the students who received a grant graduated in the same semester the grant was awarded, and another 5 percent graduated within one semester. Charlie Andrews, assistant vice president for Undergraduate Education, can appreciate how dramatically the educational experience has evolved. An FIU alumnus, he earned a math degree with an emphasis in education in 1994. Unlike when Andrews was a student, today’s freshmen are required to declare a major because research shows that students who declare a major early in their college career are more likely to graduate. “Gone are the days that you can take two years to figure out what it is you want to be in life,” says Andrews. Irene Delgado has enrolled at FIU twice. The second time around has been a much better experience, thanks in part to advisor Cynthia Perez. “She’s been the key to my feeling at home at FIU this time around,” Delgado says. That makes academic advising all the more critical for students like Irene Delgado. Originally from Puerto Rico, Delgado went to Pittsburgh in the 1990s at the age of 18 to study communications. Soon she was married with a baby on the way; school was not a priority. 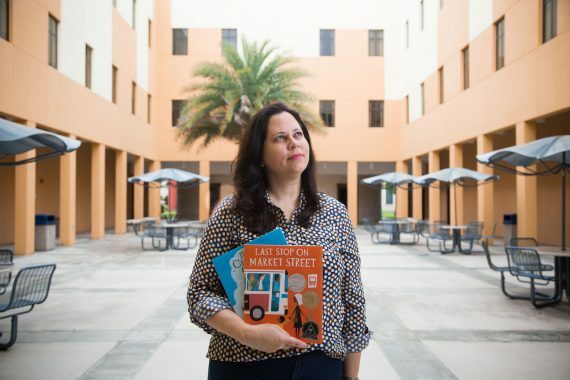 She returned to school — this time to FIU — in 2002. “I picked hospitality management because I liked people,” she says. Once again, it didn’t work out. Now that her daughter is in college, she came back to FIU in 2015, choosing early childhood education as her major. Delgado, who is on track to graduate in Spring 2018, credits advisor Cynthia Perez with helping her “feel at home.” This time around, she says, her FIU experience is different. Approximately 75 new advisors have been hired since 2010. Collectively, advisors interact with all undergraduates both in person and online using university software that tracks a student’s academic progress. If a student fails the first test or never attends class, his or her faculty member can send an alert to both the student and advisor. The advisor then schedules an appointment with the student to discuss resources that are available to help. A low GPA will trigger an alert as well. The alerts get more strategic the more hours a student completes. 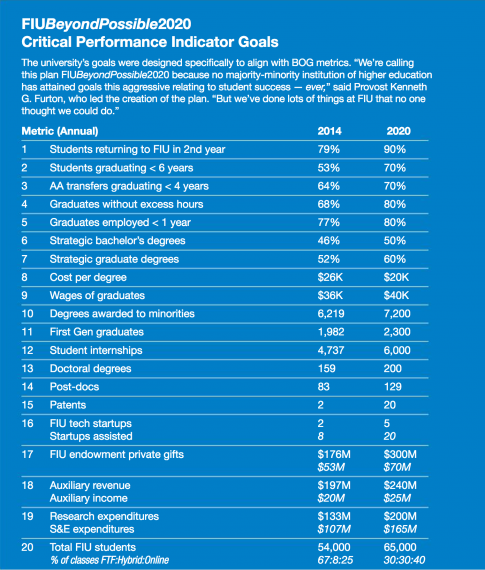 With a BOG metric that measures how many students graduate within six years (that metric is changing in 2018-19 to track a university’s success at graduating students within four years), FIU now requires students who have earned 90 of the 120 credits needed to graduate to meet with their advisor to create a graduation plan. Not only does it help students, Andrews says, it helps the university with its course planning. Andrews says that today’s methods are more effective than previous ones. The funds are being poured back in to university initiatives that improve performance success for students as well as post-graduation success. No one professes to know what the future holds for higher education, but optimism remains high for the way FIU is handling this sea change. After graduating in May with a bachelor’s degree in computer science, this international student is off to MIT in the fall to pursue a Ph.D. in computer science. Geeticka Chauhan ’17 wanted to attend college in the United States. The reason, she said, was simple: She felt that a U.S. university would offer a more well-rounded education than an engineering school in her native India. After considering offers from several U.S. universities, she chose FIU, in large part because she received a Presidential Scholarship. This allowed her to complete her undergraduate education debt free, which she says was an important consideration. Building a new life 9,000 miles from home was daunting. Chauhan says the personal attention she received from advisor Tiana Solis and her department professors helped her make the transition. Solis took the time to get to know her and routinely recommended courses she thought the Honors College student would enjoy. “I found my advisor and my professors willing to help the students in any way they could. Many times my professors went above and beyond to help me out,” says Chauhan, who was involved in three research projects while at FIU. She says her FIU experience was better than she envisioned. In addition to her research projects, highlights included a Study Abroad to France and an Honors College course in which students portrayed characters in the French Revolution. Chauhan used an online tool called Panther Degree Audit throughout her FIU career. She checked it every semester to make certain she was on track to graduate in four years, which she did. As she looks ahead to MIT, she says her experiences at FIU have helped clarify what she would like to do in the future. Wow… Is all I can say. As an FIU graduate and 30 year veteran teacher I was taken aback at the high percentage of students struggling with college Algebra. That says a lot about the learning gaps with which students graduate high school. I am thrilled that FIU developed a way to help these students. It has been my personal experience to note that the way Math is taught during elem. school changes “drastically” once students hit middle school….. And oftentimes they (the students) end up falling out of love with numbers. Such a shame….. Algebra is a fantastic branch of mathematics…. So practical and we use it everyday without realizing it. Thank you for the article. I will be sharing it with my colleagues and administrators. Go Sunblazers!!!! Oops… Strike that……. Go Panthers! !